With so many returning characters from both the classic and X series, one wonders if there's enough room in Rockman Online for some originality. Fortunately there is. Neo Wiz Games has lifted the veil on a newly announced character named Irene (pictured); a Navigator who will oversee the player's progress. Irene's introduction comes way of a special Christmas message from the Neo Wiz staff, wishing fans a merry Christmas (and a Happy New Year). Speculation indicates Neo Wiz will give Irene a proper introduction in a future post, where her involvement in Rockman Online will be explained in greater detail. Navigators sport a new look in this era, laced in Tron-esque lights and panels, among other changes. So far, the characters have only appeared in SD form. Irene will be joining the likes of Alia and Layer in Rockman Online, two returning Navigators from the X series. 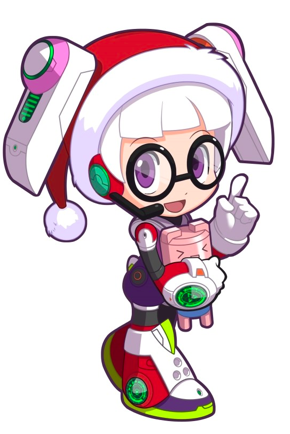 Command Mission's Nana is also expected to return, though Neo Wiz have yet to officially recognize her. This is probably the last Rockman Online update for 2011. Well, no I take that back: we have an English translation of the third fan Q&A session coming along. But in terms of new info about the game itself, I think it's a wrap. Well, there's always 2012.
i'll probably create an account for this if they allow people outside of that country to do so.